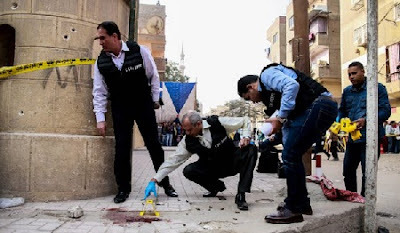 A gunman today opened fire at a church in south of Cairo, killing at least nine people before policemen shot him dead, officials and state media said. Health ministry spokesman Khaled Megahed told state television that the gunman who was shot dead had killed nine people and wounded others, including a police officer. The gunman had tried to storm the building when police shot him dead, police officials said. Cellphone footage posted on social media appeared to show the bearded gunman wearing a bulky ammunition vest sprawled on a street, barely conscious, as people restrained his arms and then handcuffed him. Congealing blood could be seen at a guard post in front of the church. The Daesh group’s affiliate in Egypt has killed dozens of Christians in church bombings and shootings over the past year, and has threatened further attacks against the minority.